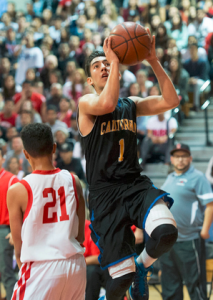 AZUSA — Who is the best high school boys basketball team in the San Gabriel Valley Newspapers coverage area? For one night, the mythical crown goes to Damien. Senior Jeremy Hemsley scored 27 points and Bryce Peters had 17 as the Spartans, ranked No. 1 by the San Gabriel Valley Tribune, beat Whittier Daily News No. 1 Cantwell Sacred Heart of Mary, 63-49, in a Southern California Shootout game at Azusa Pacific. 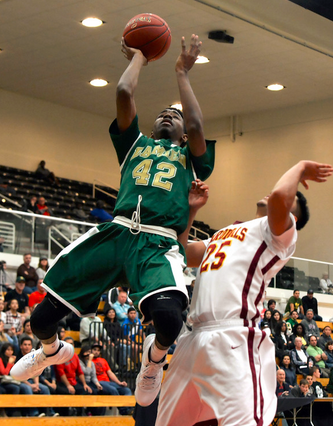 Damien, also getting eight points from Malik Fitts, improved to 20-2. Gligorije Rakocevic had 27 points and 15 rebounds for the Cardinals, who slipped to 12-10. The key moments for Damien, which made 19 of 47 shots, came at the end of the second quarter and the beginning of the third. The Spartans, getting 11 points from Hemsley and nine from Peters, closed the half with a 17-8 surge to lead 29-20. Damien then opened the third quarter with a 9-5 spurt to go up 38-25 at 4:28 following a Hemsley putback and a 3-pointer by Fitts. Cantwell, getting consecutive baskets from Luka Radovic and Rakocevic, closed to within 48-42 with 3:40 left. But Damien countered with 3-point plays by Peters and Hemsley and a 3-pointer by Micah Robinson for a for a 58-47 cushion with 1:17 left. “We played hard,” Cantwell coach George Zedan said. “We had some guys we were counting on who didn’t play well. It was a little frustrating with that. But they are a good team, ranked No. 8 in the state. WEST COVINA — Different boundaries, different result. With the West struggling in recent years, game organizers changed the borders used to pool talent from the 605 Freeway to Azusa Avenue. The game was also moved from late spring/early summer to January in an effort to help players get some last-minute recruiting attention before signing day next week. WHITTIER — The road to the Del Rio League boys basketball title will run through defending champion California High School. Isaiah Martinez made sure of it. Martinez nailed a 3-pointer as time expired and the Condors took control of the league race with a 61-58 victory over host Whittier on Friday. Jake Mata scored 15 points and Brady Gravitt had 14 for the Condors, who improved to 14-8 overall and 5-1 in league play. California also got 13 from Traie Kastl and 10 from Macias. Anthony Rios had 21 and Miguel Salazar 17 for Whittier, which slipped to 18-4 and 4-2. Whittier Christian 4, Village Christian 0 — Natalie Oronoz and Fatima Montelongo each scored two goals to lead the Heralds to an Olympic League victory over Village Christian. Camilla Montelongo assisted both of Fatima Montelongo’s goals for Whittier Christian (10-7-2, 3-1-1). Makenna Fuehrer assisted Oronoz’s second goal. Flintridge Sacred Heart 2, Notre Dame 1 — Nia Harris and Amethyst Trang each had a goal for Flintridge Sacred Heart, leading the team to its third league victory this season, defeating Notre Dame. 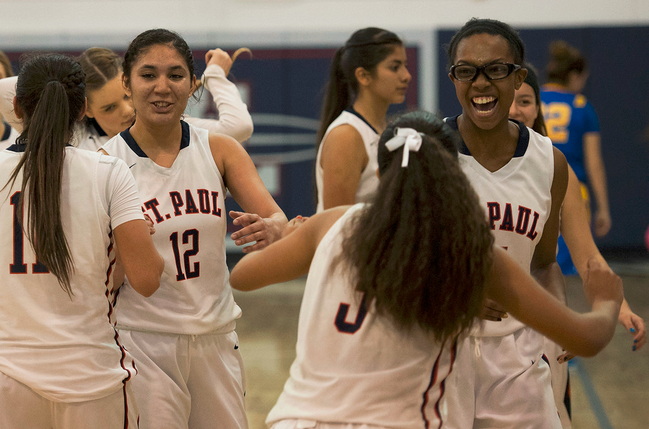 Girls Basketball: St. Paul gets first sweep of Bishop Amat in 24 seasons. SANTA FE SPRINGS — There was no league title at stake when the St. Paul High School girls basketball team hosted Bishop Amat on Thursday. It just seemed that way. That’s what sweeping your rival for the first time in nearly three decades will do for you, especially one that has had the upper hand in the series. Clarissa Perez scored 19 points and Adrianna Gonzalez had 14 as the Swordsmen beat the Lancers for the second time, scoring a 53-38 victory in a Del Rey League game at St. Paul. St. Paul, which won at Amat (69-45) on Jan. 13, improved to 14-10 overall and 2-3 in league play. Bishop Amat, getting 14 points from Jurhandi Molina, slipped to 7-15 and 0-5. St. Paul, after falling behind, 16-7, after the first quarter, put together a 14-minute stretch in the second, third and four quarters where it outscored the Lancers, 27-4, for a 45-28 advantage late in the fourth. 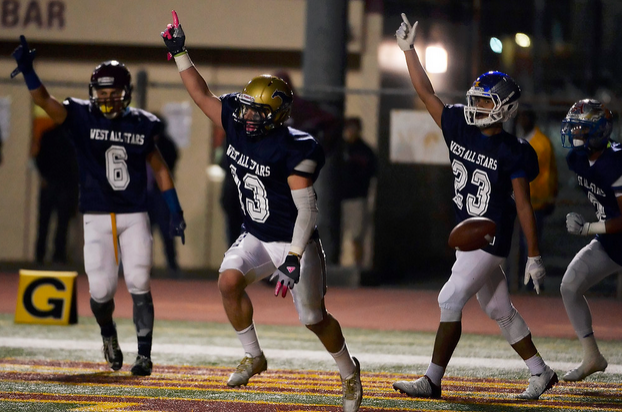 The stretch included keeping Bishop Amat scoreless for more than eight minutes over the final seven of the third and the first of the fourth.